Clear One’s COLLABORATE is a voice, video, and data collaboration solution all-in-one. COLLABORATE All-In-One combines Clear One’s professional audio with Built-in HD Video Software Codec for HD video conferencing. 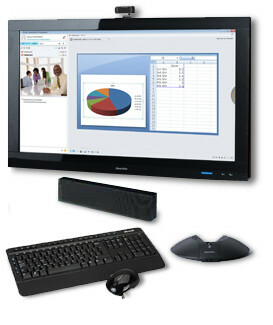 Users can consume rich, high-definition multimedia content from anywhere on the enterprise network on to the 46” 1080p LCD display through the optional VIEW Multimedia Viewer. Content is consumed in the form of live media broadcasts, corporate presentations, on-demand videos, real-time dashboards, digital signage, etc. The true plug & play simplicity of this HD Audio and Video conferencing system along with its Advanced data sharing capabilities make it perfect for conference and meeting rooms, as well as executive offices.